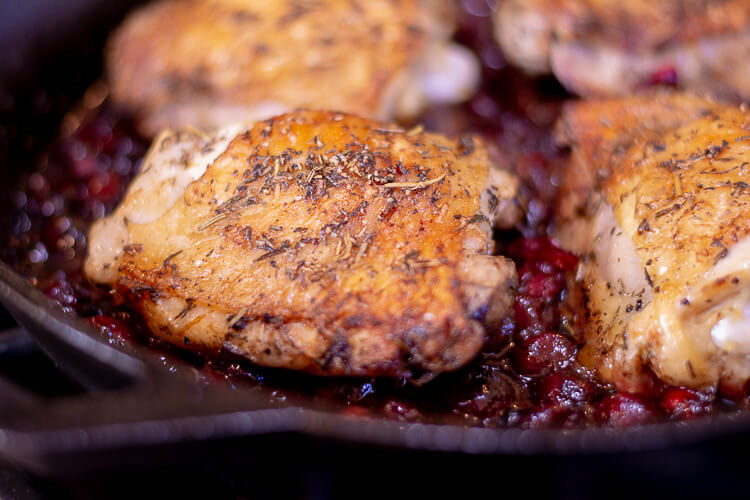 One Pan Cranberry Chicken Thighs are made in a flash – all in one cast iron skillet! This recipe tastes like you went to a lot more trouble than you actually did so feel free to bring on the dinner guests! 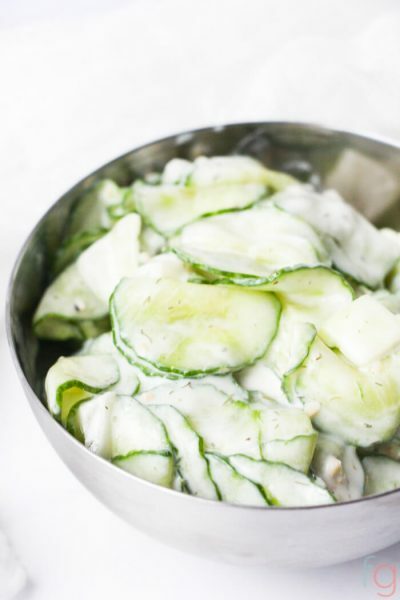 The taste is tangy, tart and leaves you craving more as the season progresses! 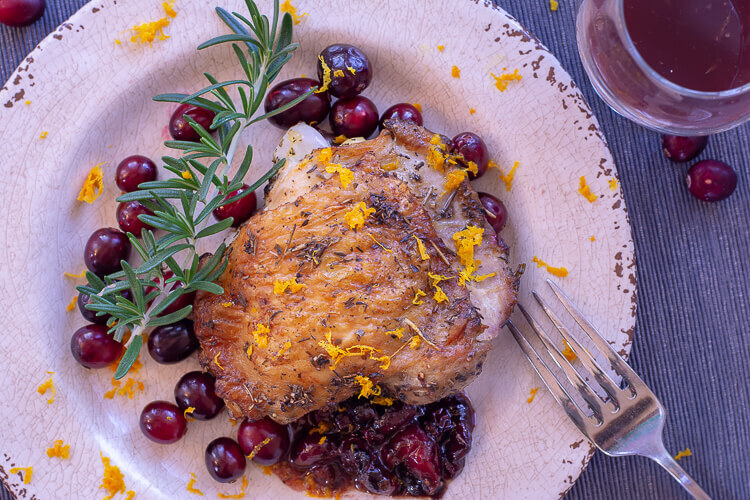 Cranberry season doesn’t last long in the fall, so I love to whip up a couple of great recipes to enjoy a flavor that is hard to come by the rest of the year. Don’t you love seasonal ingredients like cranberries and pumpkin? Items that you can only get for a short period of time make me go all out and crazy making everything I can while they last. This recipe uses skin-on chicken thighs, fresh cranberries and savory herbs to produce a recipe that is not only gorgeous, but tastes amazing as well! The crispy skin holds all the herbs while the bottom half of the thigh holds the cranberry/balsamic flavor. Each bite is slightly different and oh-so good. Cooking in a cast iron skillet is addicting! Yes, I have some amazing All Clad pans that I love, but the cast iron rarely is put away and I can’t wait to share with you why! Cast Iron pans heat evenly. The entire pan is made of the same material. You hardly ever need to worry about a hot spot. If it doesn’t cook evenly, check your stove top burner. I know mine seems to angle a bit and there is one spot on one burner that is a little wonky. It’s not the pan, it’s the burner! 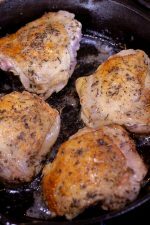 Cast Iron pans go from the stovetop to the oven seamlessly, as you will be doing for this recipe! You can season and brown the skin easily on the stovetop and them pop in the oven to finish cooking. That versatility is fantastic. Once you cook with them several times, they will naturally season, which means they become nonstick. I love that! Clean up is a breeze. I have a little Pampered Chef scraper (remember those brown ones we all would get at a party?) and everything usually comes off with hardly any effort. If your cranberries stick in this recipe, soak the pan for a few minutes (not more than that because you don’t’ want it to rust!) and then scrape. Easy!! Enjoy the variety of recipes that are out there now using seasonal ingredients. Yes, you can freeze fresh cranberries (our newsletter included how-to’s on it in case you are looking to freeze a batch!) and use in this dish. Freeze fresh cranberries and use in this recipe. Spread cranberries out on a cookie sheet and place it in the freezer. On the next day, remove them and place them in a ziplock bag. 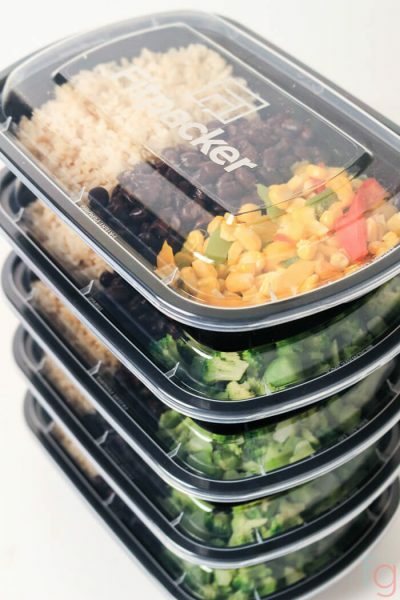 Place them back in the freezer for later use. They defrost in less than an hour on the counter and you can use them the exact same way for this recipe. It’s a great way to extend their life. Substitute lemon or lime juice/zest for the orange juice/zest. Use a combination of rosemary and thyme in place of the herbs de provence. We sometimes cheat (shhh – don’t tell anyone) and use whatever fresh herbs are available in the garden. Use a different cut of chicken. Using boneless, skinless chicken breasts will work but use your kitchen mallet and make them thinner and more even. Precut the Chicken. To make this recipe even easier, cut up slices of chicken, and cook the same way. Toss the cranberries on top and cook for just about 10 minutes on the stove top. Be careful to adjust the cooking time to avoid the chicken over-cooking. 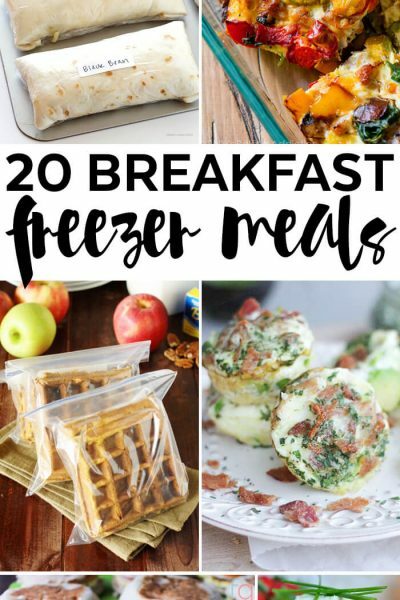 Recipes that are quick, easy and delicious are always my favorite! So let’s get started with this one. Mix together the olive oil, herbs de provence and garlic. Rub this on the chicken and add some salt and pepper. Sear the chicken thighs on a nice heated cast iron skillet. To help obtain that crisp skin that we all want, be patient and allow the oil to get toasty and lightly smoke. This can take 4-7 minutes. But, once you place your chicken skin side down, it immediately starts to sizzle and you will be so happy you waited. Cook the thighs for 5-7 minutes and flip them over. Cook another 5 minutes. While the chicken is cooking, combine the brown sugar, orange juice, orange zest and balsamic vinegar together in a bowl. Add the cranberries to the mixture. 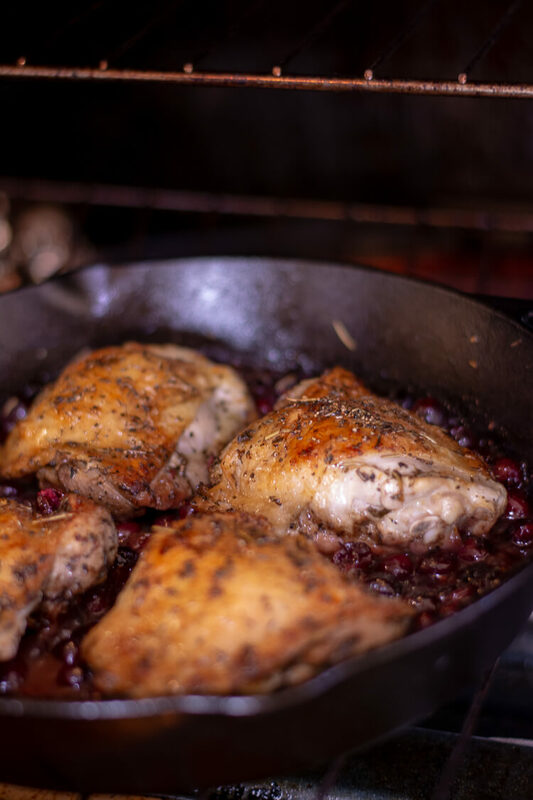 Once the chicken has cooked for a total of 10-12 minutes on the stove top, pour in a cup of white wine or chicken broth and scrape the bottom of the pan to get the delicious remnants mixed in. Allow this to boil for 2-3 minutes and place the chicken back in the pan. Add the cranberry mixture to the top of the chicken thighs and put the entire pan in the oven for 20 minutes. You will hear the cranberries start to cook and pop open! That is a great sound! After 20 minutes, check the internal temperature of the chicken. It should reach 165 degrees to ensure that it is fully cooked. Measure everything out and place in their own containers for the chicken rub. Measure out everything for the cranberry mixture and place in their own containers. You can easily substitute unsweetened dried cranberries for fresh if you have a cranberry craving off season! 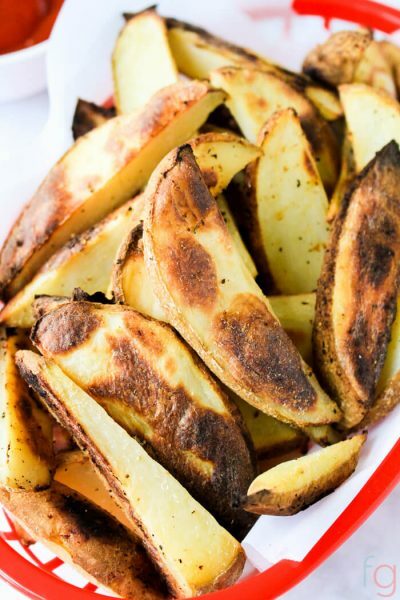 This is so easy, you may want to use dried instead of fresh! Measure out the amount of cranberries needed and place in a bowl. Pour boiling hot water over them and allow to soak for 20 minutes. Drain, and the cranberries will be ready to use – just as if they were fresh! What vegetable dishes would go well with this and why? Glazed carrots, roasted brussel sprouts, baked potatoes, butternut squash or even a simple sauteed zucchini and yellow squash will make this meal come together quickly on a weeknight leaving you more time to catch up on the days of your loved ones. Did you try it? What did you serve with it? If you like this recipe, please pin it to your pinterest board. I lose recipes all the time! Don’t forget to follow me on Facebook, Pinterest or Instagram. Scrumptious one pan meal that goes from stove top to oven with ease! 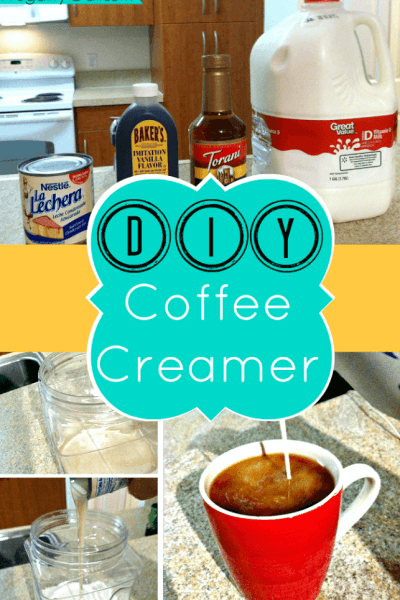 A recipe that can be made effortlessly! Preheat the oven at 425 degrees. Combine herbs, garlic and olive oil together in a bowl. Rub on chicken thighs. Heat cast iron skillet on stove top at medium high heat. Wait for the oil to heat up several minutes before placing chicken in pan to create the sear. Once fully heated, place in hot skillet. Cook each side of the chicken for 5-7 minutes. While the chicken is cooking, combine the brown sugar, balsamic vinegar, orange juice, and orange zest in a bowl and mix together. Add in the cranberries and mix together. Remove the chicken from the pan and pour wine or chicken broth into the hot skillet. Scrape up the remnants on the bottom of the pan and cook for 2-3 minutes. 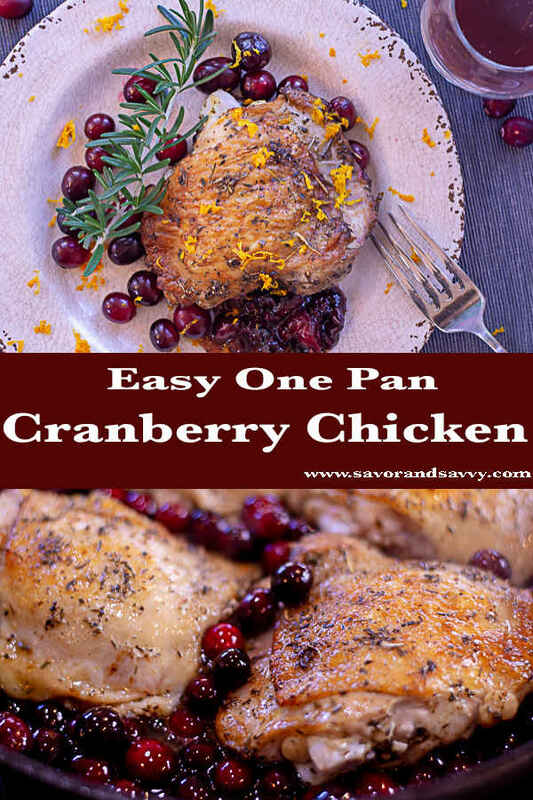 Place chicken back in the pan and cover with the cranberry mixture. Place skillet in heated oven for 15-20 minutes or once the chicken reaches 165 degrees internal temperature. 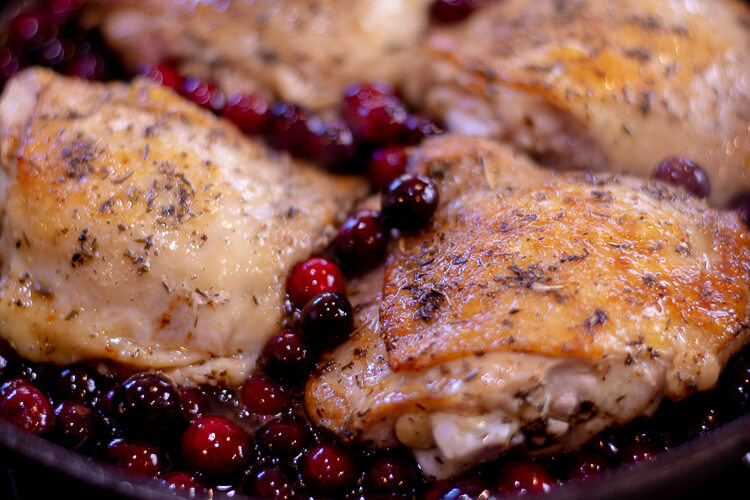 If your chicken thighs are large, cook the thighs in the oven for 5-7 minutes prior to putting the cranberry mixture in as they will cook too long and burn.